Tributes left at the scene of the accident on Gelderd Road. Two teenage boys were killed and two others left with life-changing disabilities after the driver of the car they were travelling in drove “like a lunatic”. Thomas McMeekin, 23, was today warned that he is facing a lengthy prison sentence despite also being left severely disabled in the horror crash. A court heard George Wharton and Rhys Baker, both aged 14, were killed after McMeekin lost control of his Peugeot 206 on Gelderd Road, Morley, and struck a tree. A 15-year-old boy was left with brain injuries. His 14 year-old friend is know tetraplegic and will require lifetime care. 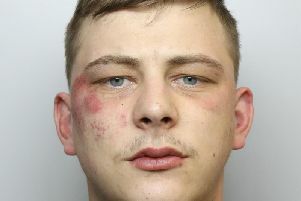 Leeds Crown Court heard McMeekin, of Bruntcliffe Road, Morley, is now also tetraplegic after being thrown from the vehicle during the collision. McMeekin pleaded guilty to two offences of causing death by dangerous driving and two of causing serious injury by dangerous driving. Jonathan Sharp, prosecuting, said said McMeekin had a history of bad driving, including driving with children in his car and showing off. Unemployed McMeekin would often drive teenagers around in his car if they paid petrol money. The fatal collision occurred on the afternoon of March 7 last year after McMeekin had picked them up. Mr Sharp described how a woman was driving her car along Gelderd Road when she saw McMeekin drive up at speed behind her. McMeekin saw the vehicle in front of him at the last moment and turned sharply to avoid a collision. He then lost control of the car and collided with a tree as the car spun through 180 degrees. The court heard witnesses who stopped to help came across horrific scenes. McMeekin had acquired the car five days before the incident after his mother financed the purchase. Three days before the incident he was seen driving in the car park of Birstall Showcase cinemas so dangerously that the vehicle lifted onto two wheels. Three other passengers were in the car at the time. A day later he drove at excessive speed as he raced another vehicle, which left his female passenger distressed. Two nights later, March 6, McMeekin had six passengers in his car at once as he drove them to a party. Mr Sharp said: “A witness described him as ‘driving like a lunatic’. He was travelling down a single-carriageway road when he performed a hand-brake turn into the mouth of a junction where another witness was just about to cross. Mr Sharp read statements on behalf of relatives of the four victims in which they described the emotional turmoil they had suffered through McMeekin’s actions. George Wharton’s mother, Sharon Hull, described how she often had to pass McMeekin’s home. Anna Mackenzie, for McMeekin, said her client had “profound regrets” at the way he behaved. The Recorder of Leeds, Judge Peter Collier, QC, adjourned sentencing in order to obtain information from the Prison Service to ensure appropriate facilities are available to care for McMeekin in custody.